The much-anticipated American Athletic Conference matchup between No. 11 UCF and No. 24 Cincinnati began with unrivaled energy this season. Spectrum Stadium better known as “the bounce house” was indeed bouncing. Cincinnati started the game off with the ball and on the first two plays were penalized for a false start and then a delay of game. The UCF defense came out to play in the first quarter stopping Cincinnati on their very first drive. Milton uncharacteristically fumbled the ball on the one-yard line on the following possession. The Bearcats recovered the ball in the end zone for a touchdown. Cole Smith missed the extra point making it an early 6-0 lead for Cincinnati. Cincinnati’s defense gave the Knights trouble again on their second drive forcing them to punt it away. The Bearcats were given good field position, but the Knights defense continued to dominate. Forcing them to kick a 38-yard field goal that Smith missed. The Knights got the ball back and wasted no time. Milton hit Snelson for back to back completions, one for 15 yards and another for 28. Milton then hit Greg McCrae on 3rd down for 27 yards. Milton finished the drive off himself with a 3-yard touchdown run. After a Matthew Wright extra point the Knights went up 7-6. On the ensuing possession Cincinnati was driving after a clutch 19-yard run by quarterback Desmond Ridder bringing them into UCF territory. The Knights defense forced yet another field goal attempt. This time it was blocked by Joey Connors and taken back for 53 yards by Brandon Moore. The Knights offense got the ball back and Milton ran the ball for 5 yards to the Cincinnati 22-yard line to end the first quarter. Milton started the second quarter on a 17-yard touchdown pass to Adrian Killins putting the Knights up 14-6 after another good point after. UCF’s defense once again held strong forcing a punt this time. That next Knights drive was started off by a deep ball from Milton to Tre Nixon for 47 yards. They were forced to a 4th down situation in Cincinnati territory where they went for it. They could not convert and turned the ball over on downs on the Cincinnati 17. This was no worry for the Knights as the defense was once again lights out forcing another punt. The very next drive the Knights offense led by Milton drove down the field. Killins had a run for 11 yards then Milton hit him for a 12-yard pass. After a false start penalty Milton hit Snelson for 13 yards and capped the drive off with a 36-yard touchdown pass to Tre Nixon on 3rd down. Wright buried another extra point extending the lead to 21-6. Cincinnati finally looked like they were putting a scoring drive together to end the half getting deep into UCF territory. That drive was ended as Titus Davis stripped Ridder forcing a fumble to end the half. The second half started a little slower. UCF began the 3rd quarter with the ball and punted it away on the first possession. This gave the defense another chance to keep beating up on the Cincinnati offense. That is just what they did. UCF’s defense forced a fumble that was recovered by Joey Connors. The Knights could not cash in on the good field position. They were forced to a 49-yard field goal that Wright uncharacteristically missed. The Bearcats were driving again on the ensuing possession and were forced to go for it on another 4th down. They were stopped by the red-hot Knights defense and turned the ball over on downs. 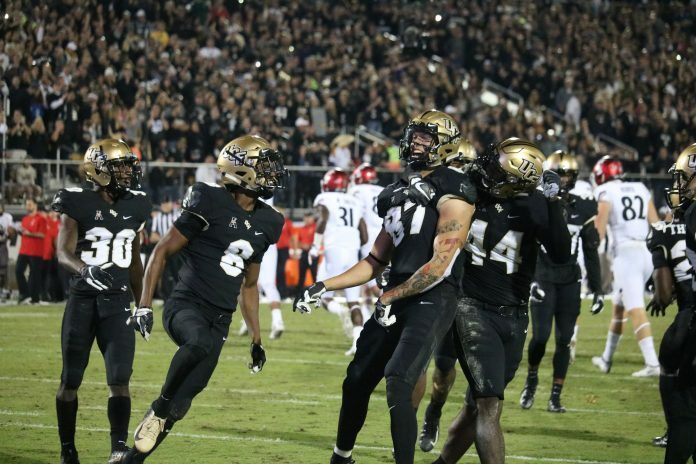 UCF strung a couple of rushes together to get into Cincinnati territory. Milton then ended the drive on a pitch to Killins who took it 42 yards to the house. After Wright split the uprights the Knights lead was now 28-6. The story of the game was Cincinnati not being able to finish drives. The Bearcats were driving once again until UCF linebacker Pat Jasinski rocked Cincinnati’s QB Desmond Ridder and forced another fumble for the Knights defense right before the 4th quarter. After two unsportsmanlike conduct penalties against Cincinnati on the fumble play the ball was placed on the Cincy 34. The Knights took to the ground to start the 4th quarter as Milton rushed for 11 yards then McCrae for 9. They went right back to McCrae on the next play. This time he punched it in for an 11-yard touchdown run. After a made extra point the score was now put out of reach at 35-6. The Bearcats still showed some pride on the next drive. With key rushes from Tavion Thomas and Ridder the Bearcats got into the red zone. Thomas ended the drive with a 1-yard touchdown run giving the offenses their first touchdown of the game. After a good point after the score was now 35-13. The Knights added another 3 points on the board after a Wright 33-yard field goal. UCF has now increased there win streak to 23 games. They also put on a show for the whole country tonight in a prime-time game. It was an eventful day on campus with College Gameday being in Orlando and it also being senior night. The Knights have now clinched the division with a 38-13 win over Cincinnati. They look onward to a rivalry game to end the season next week against USF in Tampa.